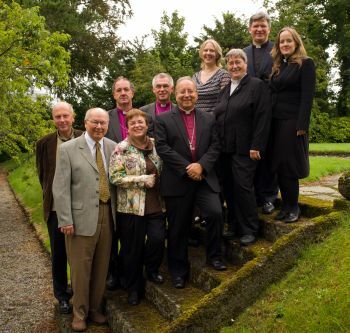 The Anglican-Old Catholic International Co-ordinating Council (AOCICC) met in Kilkenny, Ireland, from 27 to 30 August 2014. This was the second meeting of the Council in its present round. - Briefing each other about developments in the bilateral ecumenical relationships in which each Communion is engaged. A special session of the Council was devoted to engaging with representatives of European institutions in Ireland, to understand better the possibilities for engagement and witness in Europe; particularly how to take advantage of the opportunities for consultation afforded the Churches under the EU treaties. The Council prayed and studied the Bible daily and, having visited the St Willibrord exhibition in Carlow, celebrated the Eucharist at Leighlin Cathedral together with members of the Church of Ireland. The Council is grateful to the Diocese of Cashel, Ferns and Ossory for its hospitality, the Dean and parishioners of Leighlin, and especially to Bishop Michael Burrows and his family, who welcomed the Council into their home for the meeting. The Council wishes to record its gratitude to Canon Dr Alyson Barnett-Cowan for her distinguished contribution to its work over the last five years, and assures her of its prayers for the future. The Council will meet again in Zurich, Switzerland 26–30 May 2015.
the Revd Lars Simpson +41 44 211 12 76, lars.simpson@christkath-zuerich.ch; or Canon Dr Alyson Barnett-Cowan at the Anglican Communion Office, +44 20 7313 3930, alyson.barnett-cowan@anglicancommunion.org .